Can you believe that it’s already more than halfway through November? It feels like this year is flying by and there hasn’t been much room to slow and down and breath. Thanksgiving is in less than a week (what?!) and while I am excited to go home and spend time with my family, I am also acutely aware that this can be a really challenging time if you’re struggling in your relationship with food. 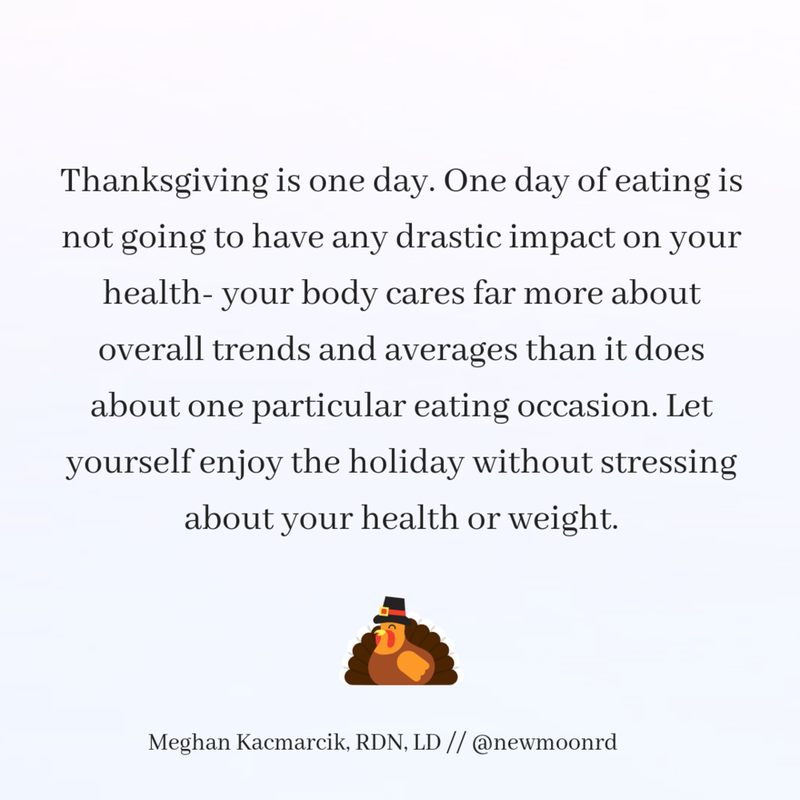 I’ve been talking with a lot of my clients recently about the upcoming holiday and wanted to share some of my thoughts about navigating food on the holidays. Of course, intuitive eating isn’t something we can learn in one day but I’ve chosen to organize my thoughts using the 10 principles of intuitive eating because I think they all apply in their own particular way. I hope at least some of them resonate for you right now! One of the biggest ways I see the diet mentality popping up around the holidays is this idea that we have to eat as much as we can the day of because who knows when we’ll have access to that food again? It’s the typical “diet starts tomorrow” type stuff that usually results in being hella uncomfortable and it is absolutely the diet mentality coming into play. There are so many other ways and “diet tips” we get around the holiday season. Unfortunately, there’s no way to clear our hard drives of that information but it might help to turn down the dial a little bit on those thoughts. Try acknowledging them for what they are (“this is a diet culture thought”/ “this is an eating disorder behavior”) and see if you can make space to sit with them, without buying into it. Don't skip breakfast! So many people skip breakfast in anticipation of the big Thanksgiving meal, but honestly that just makes it more likely that you'll be ravenous at dinner time meaning you're less likely to actually enjoy the food and more likely to eat to the point of discomfort. No matter what you're eating later, you still need to eat in the morning and consistently throughout the day. And yes, that means eating something if you’re hungry later on in the day after the big Thanksgiving meal. Your body doesn’t know it’s a holiday and it will probably want to stick to its usual schedule. So if you’re eating Thanksgiving early in the day, tune into your hunger cues and maybe plan to have some leftovers or a snack in the evening. You’re allowed to eat all foods. Every single one of them (barring any allergies or medically necessitated restrictions). You don’t need to force yourself to eat white meat if what you really want is dark. You don’t have to skip the pie or mashed potatoes. You have permission to eat any and all foods you enjoy, period. The food police are those little voices in your head that pop up and tell you that what you’re doing is wrong, yell at you for having another piece of pie, or remind you of how many calories something is. Spoiler alert: these voices aren’t helpful at all, ever. If you hear them popping up, acknowledge them (“I notice I’m having the thought that…”) and kindly -or unkindly- tell them to hop off. Ain’t nobody got the time. This is my favorite intuitive eating principle because it makes room for joy and pleasure at meals. It’s okay to eat because things taste good. Food is inherently soothing and it’s supposed to be satisfying. It’s supposed to taste good (and that doesn’t make it “bad” despite what diet culture tells you). Here’s a situation that comes up for me frequently on holidays: I’m usually physically full after appetizers and dinner but I usually always choose to have dessert because it sounds good and I know that apple pie won’t taste the same the next day. Do I need to have the dessert? No. But does it sound satisfying? Yes - and it’s normal to eat for satisfaction in addition to sustenance. This is an important principle in intuitive eating but isn’t something I have a short and concise blurb about in respect to the holidays. What I will say is that holidays are not all about the food. Sure, Thanksgiving food is delicious (okay I'm downplaying- Thanksgiving food rules) but the day isn’t about food entirely. It might be helpful to think about some of your values and how you can honor those whether that's family (biological or chosen), connection, belonging, happiness, joy. What are some of the ways you can live by these values and take some of the pressure off food? Know that you don't need to compensate before (or after) Thanksgiving for the food you're going to be eating. Your body knows how to handle variations in intake and one meal or one day is not going to have any significant impact on your health. Wear clothes that you feel comfortable in and that you won’t be pulling at all day. If you’re struggling with body image, don’t linger unnecessarily in front of the mirror. Know that you can sit out of diet/body shaming talk - you don’t need to bash your body for the comfort of others (and it’s probably the healthiest choice not to)! You know what’s not healthy? Spending all of Thanksgiving weekend stressing about when you’re going to fit in your runs/gym time. If you find a way to incorporate movement in a way that feels good during the holiday weekend (perhaps searching for that perfect Christmas tree? ), that’s great. If you don’t? No need to stress about it. Thanksgiving is one day. One day of eating is not going to have any drastic impact on your health- your body cares far more about overall trends and averages than it does about one particular eating occasion. Let yourself enjoy the holiday without stressing about your health or weight if you can. Take space for yourself if you need it. Engage in good conversation with people you love. No matter what you eat or don’t eat on Thanksgiving, you’re safe.